Zhinka dinka doo: Hoo-ah! We won! I left my car parked in the driveway long enough for a cicada to crawl up on a tire and molt. It's difficult to take cicada pictures on a tire, plus I didn't think of doing so before I plucked him off. So here he is, on a branch on Max's train table. Congratulations to all of you (and especially you)! Love the cicada "shell" -- the 17-year cicadas in Brood X emerged the year Milly was born; I'll never forget that noisy spring. They'll be back in time for her junior prom. Congrats to the winning team!! Keep up the good riding---for exercise and fun! I've taken a little internet break and have missed wishing you a happy birthday and encouraging you on you bike to work week! I ran track and played basketball in high school, and I remember all too well the excruciating all over body pain of the first week of the season. gah! I don't think I could handle that now! I admire your determination! 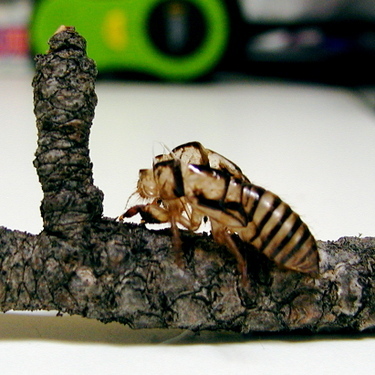 I used to collect cicada shells when I was in kindergarten, but they kind of freak me out now. Congratulations, Friend! Sorry to have been so long out of touch- now you're getting an avalanche of comments from me!